The French suit symbols we use today (diamonds, clubs, hearts, spades) became the standard for European playing cards, making Tarot, with its archaic trump suit and Italian-style pips (cups, coins, batons and swords) a conservative holdover. The name of the game changed to Tarocchi or Tarot, to distinguish it from a popular game of Triumphs played with a regular four-suited deck. Regional variations in tarot decks emerged, such as the smaller Bolognese and the expanded Minchiate deck. A version of the tarot deck used in Milan traveled to France and evolved into the Tarot de Marseille. The card-making industry shifted to France, and tarot became a mass-produced commodity. The only decks created before the mid-1500s that have survived are luxury hand painted decks and the uncut sheets of block printed cards accidentally preserved in book bindings. With such sketchy evidence, it’s extremely difficult to follow lines of influence among tarot decks. During this time, many styles of tarot cross-pollinated, and unique decks continued to be commissioned. Tarot de Marseille (TdM) imagery had been around since at least 1500, and seemed to be preferred by tarot printers, but there was always a healthy number of alternative decks available. Whenever you see “standard numbering” or “standard imagery” mentioned in these pages, it refers to the Chosson-Conver deck style that remains the standard Tarot de Marseille design today. The French Catelin Geoffroy deck of 1557 is the first block printed deck to survive. This high-quality deck has figures that are more animated and rounded than the usual stiff TdM woodcuts. The Trumps have standard numbering, and the imagery is similar to a standard Tarot de Marseilles deck, with some unique exceptions. The Tower shows two people caught in a storm, one of them playing the violin, while the Devil has a shovel over his shoulder. 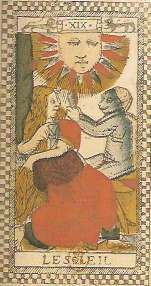 The pip cards are based on the German Virgil Solis deck of 1544 with suits of Lions, Monkey, Parrots and Peacocks. The Parisian deck from the early 1600s is the first block printed deck to survive in its entirety. The names and numbers on the trump cards are identical to the standard TdM, but the imagery seems to be a blend of several influences. The Lovers are a courting couple, the Star is an astronomer, and the Tower shows a storm with several people swirling around, one of them playing a drum. The Moon is a man playing the harp under a woman’s window, and the Sun is a woman with a monkey. In 1664, a wealthy Bolognese family commissioned an engraved luxury deck from the artist Giuseppe Maria Mitelli. This charming, copper engraved deck with delicate, swirling Baroque lines has unique imagery that’s still identifiable as the standard tarot trumps. The Sun is Apollo with his lyre. The Hanged Man reverts to its original meaning of a traitor and shows a sleeping man about to be murdered. The Devil resembles his counterpart in 19th century Milanese decks – he’s holding a pitchfork and sitting in a bonfire with a writhing monster. This deck is considered the earliest known Tarocco Bolognese, a shortened deck with some pip cards removed. In 1650 the Parisian card maker Jean Noblet created the first Tarot de Marseille deck we know of. There probably were earlier TdM decks, but we have no evidence of them. Noblet’s deck differed from the standard TdM in very minor ways: The Tower card has the sun in the top corner and fire coming out of the top of the tower rather than being hit by lightening. 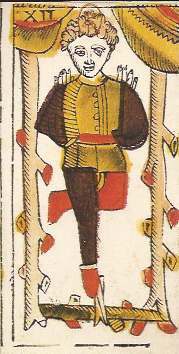 There is no bird on the Star card, the Hanged Man has odd feathery things sticking out of his shoulders, and the central figure in the World wears a cape and a belt of leaves instead of a scarf draped diagonally over her body. Another early TdM deck, the Dodal, printed in Lyon in 1714, was a transition deck between the Noblet and the standard TdM. Both decks have been beautifully restored by Jean-Claude Flornoy using traditional block printing and stenciling methods. Jacques Vieville, a Parisian card maker and contemporary of Noblet, printed the earliest known example of Belgian, or Flemish-style, Tarot. In this style, Trumps 1 through 11 are the same as the standard Tarot de Marseille, while most higher numbered trumps have images unique to this type of deck. Temperance holds a rod in one hand while pouring water from a jar into another jar on the ground. 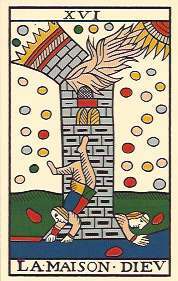 The Hanged Man is upright and the card titled is misspelled “Lepen du”. The Tower is called Lightning and shows a person under a tree in a hailstorm. The Star depicts an astronomer with calipers, the Moon shows a woman under a tree holding a spindle, and the Sun is a youth on a horse. Several figures face the opposite direction because the card maker failed to carve the wood block in mirror image, causing the printed card to come out reversed. 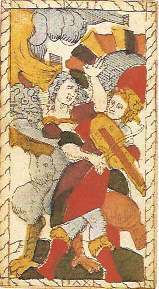 The Vieville deck is a Flemish-style deck that is unique in switching the numbers on three pairs trump of cards, as in a poem written in Pavia in 1570 based on the trumps. Three card images are similar to hand painted decks created in Ferrara in the 15th century (the astronomer with calipers, the woman with the spindle, and the World figure standing on a globe), so it’s possible the Flemish style originated in Ferrara and represents an alternate stream of Tarot imagery that re-emerged in France and Belgium in the 1600s. It’s possible this style never went out of print, we just don’t have any surviving examples from the intervening years. Card players need simple, consistent card designs that can be recognized instantly. By 1700, the fluid situation of the previous 200 years was consolidating into a standard deck. When the game of tarot became an international craze, the cards became a mass produced commodity with the Tarot de Marseille emerging as the standard design. On the next page, we’ll look at the Tarot de Marseille.